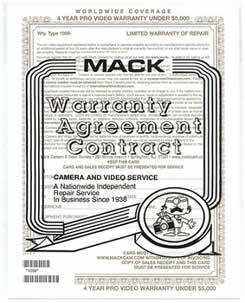 This warranty covers all parts and labor for three (3) years from date of purchase. This limited warranty applies only to the product registered with one camera body and one standard lens within the 50mm range. All Point & Shoot cameras are covered. The equipment will be guaranteed to operate properly according to manufacturer's specifications or we shall repair equipment to operate properly at no charge to you.